My girls LOVE playing in the snow! They could play and play, but sometimes this mama is COLD! 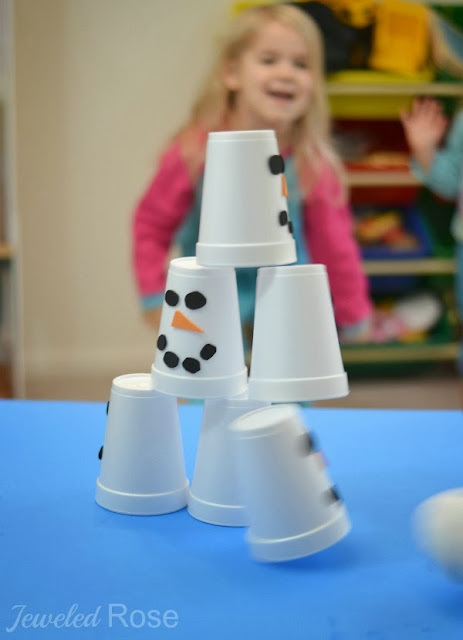 Bringing the snow indoors is a great way to let kids play and enjoy the snow while everyone is cozy and warm. 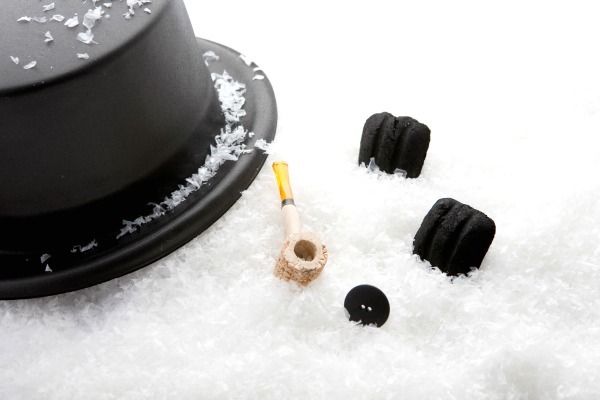 Here are a few of our favorite ways to play with snow indoors. Got snow but want to be warm inside? No problem! 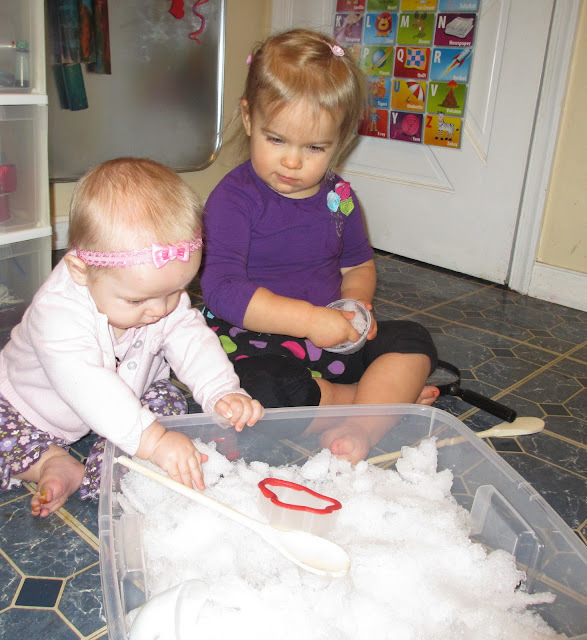 Just fill a sensory bin or container with the snow from outside. Once inside there are so many ways kids can play and explore with the snow! 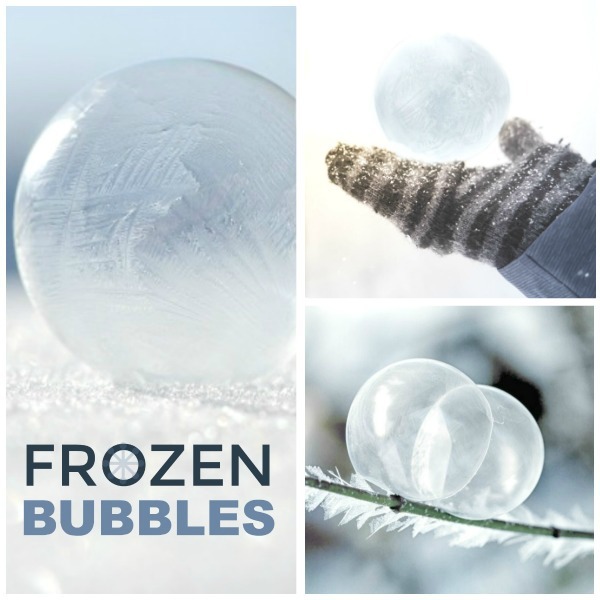 Add scoopers and other kitchen gadgets for a bit of simple exploration. 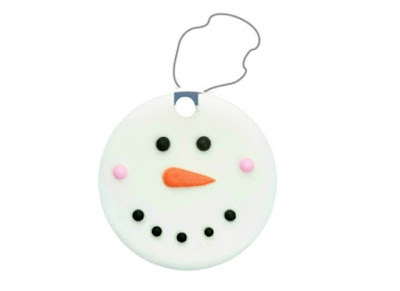 Give kids spray bottles of colored water so that they can paint the snow. 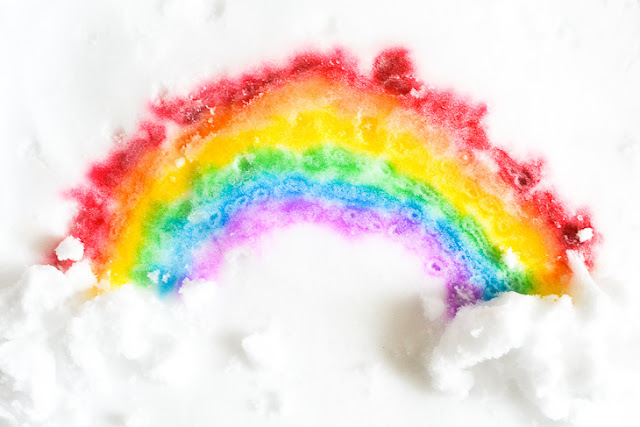 Mix 5-10 drops of food coloring with water in spray bottles, and you will have a vibrant snow paint! Paint brushes and colored water make for another fun way to PLAY. Just use containers to mix the food coloring & water instead of spray bottles. Sand toys are great for use in the snow. Add a few to the bin and kids will have lots of fun digging, scooping, and building snow castles. 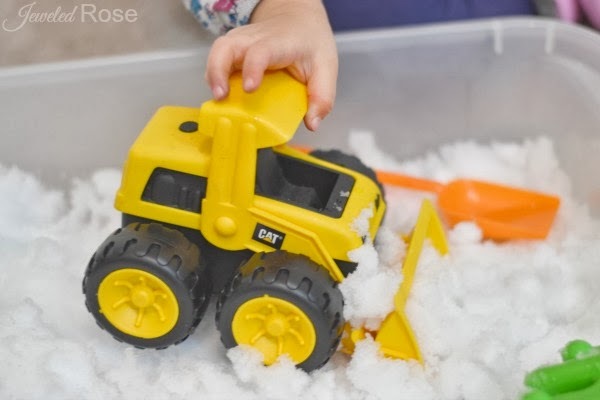 Play with cars and trucks in the snow. Make Mr. Potato Heads! 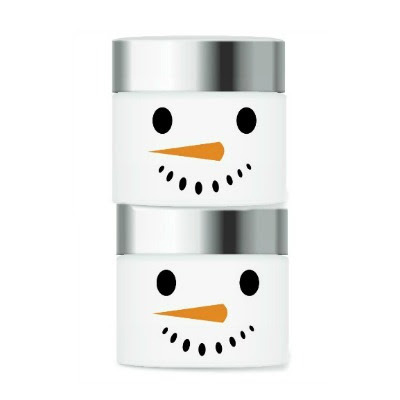 If you have potato head parts at home add them to your bin of snow- kids will have a blast making silly snowman heads! 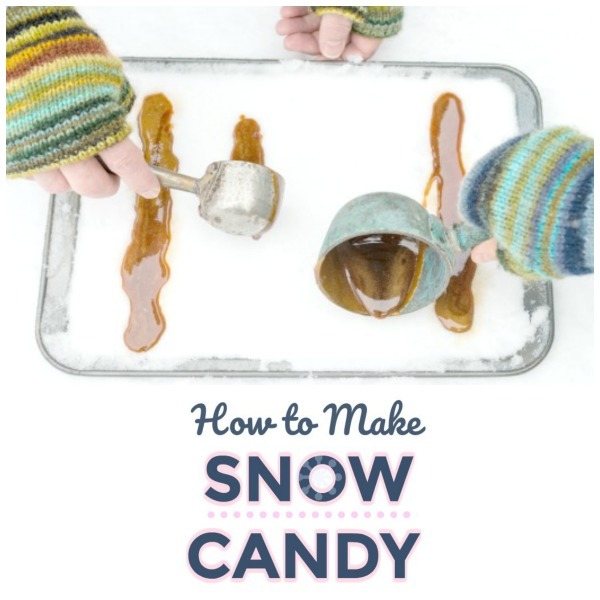 Make Ice Cream from the snow you bring inside. This is always a hit with my kids! 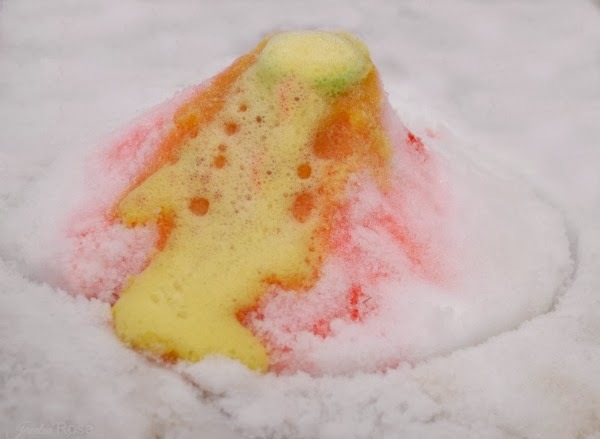 Explore Science and make a Snow Volcano in your bin of snow. We did this outside, but the activity could easily be set up inside in a large container or sensory bin. 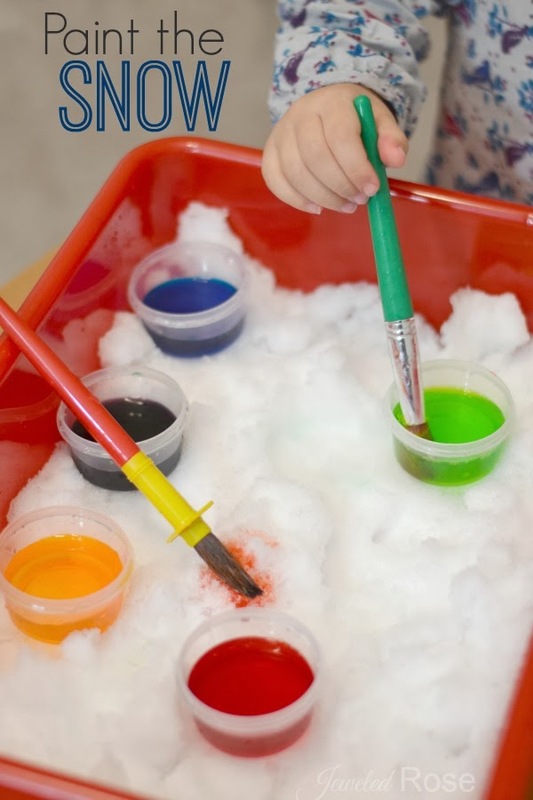 Explore color mixing in your bin of snow. No snow where you are? Do you want to build a snowman? 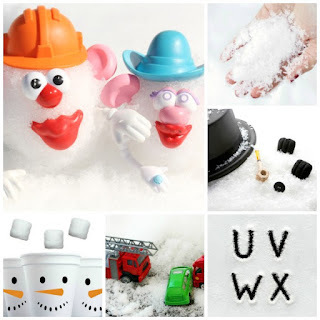 Without real snow that can be hard, but this snow clay recipe makes it easy! No need for the real thing with this simple recipe for play. Snow paint is icy cold just like real snow! 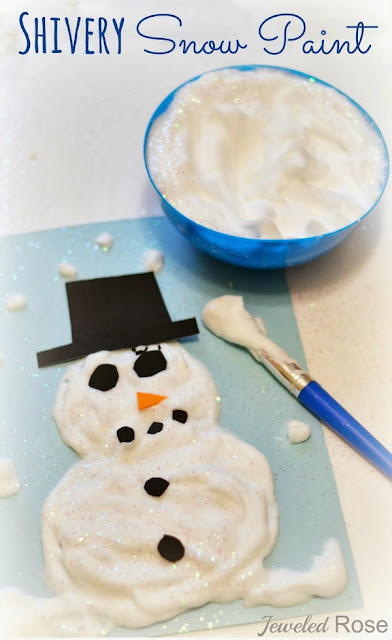 You only need two ingredients to make it, and kids can paint wintry scenes that dry puffy & raised! This stuff feels so real it is almost as good as the real thing! 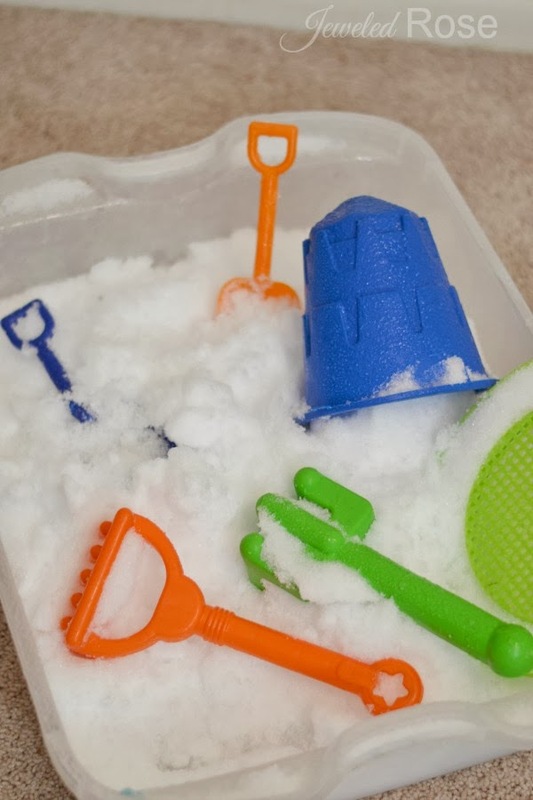 It snows often where we are, and we still make this snow play recipe often.... even in the summer. Give it a try, and you will see why! 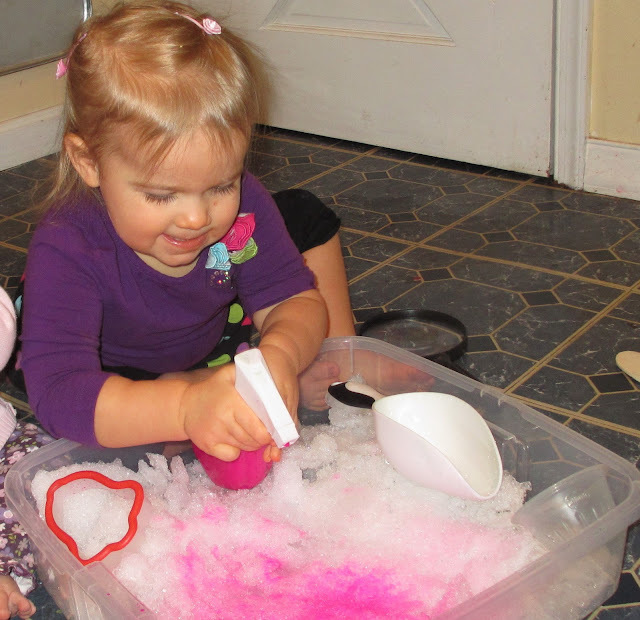 This homemade snow magically erupts as kids play! It is icy-cold, soft, and mold-able just like real snow! Give it a try- it's pure magic! 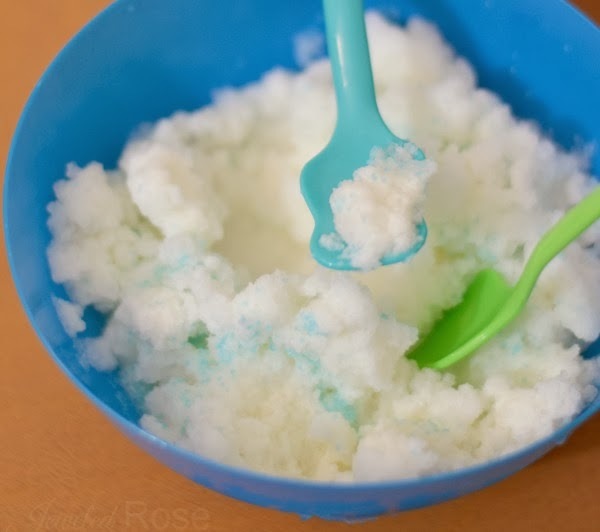 Snow slime is my kids FAVORITE homemade snow! It is icy-cold and so ooey & gooey! 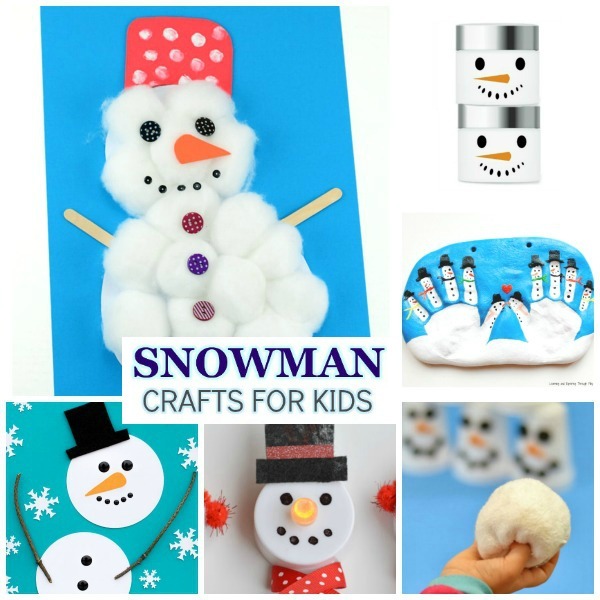 Make this and kids will have a blast making snowmen that melt right in their hands! Do your kids want to play in the snow but there isn't any? 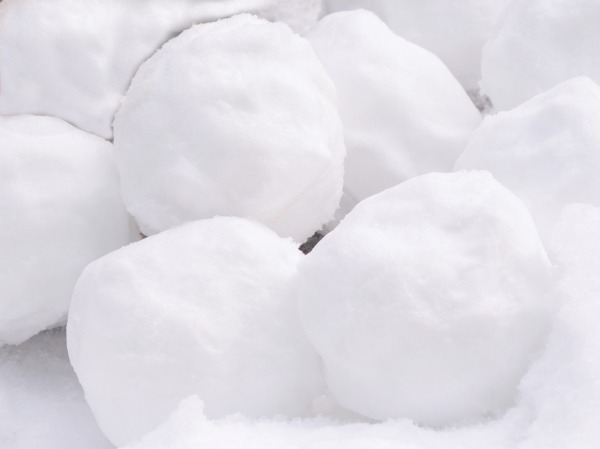 This indoor snowball game should do the trick! 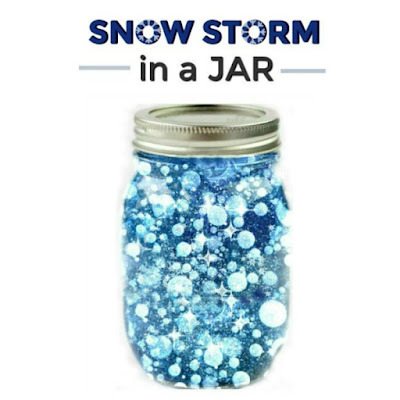 This fun science experiment allows kids to make their very own snowstorm, all while warm & cozy inside! Don't worry; it's not messy! 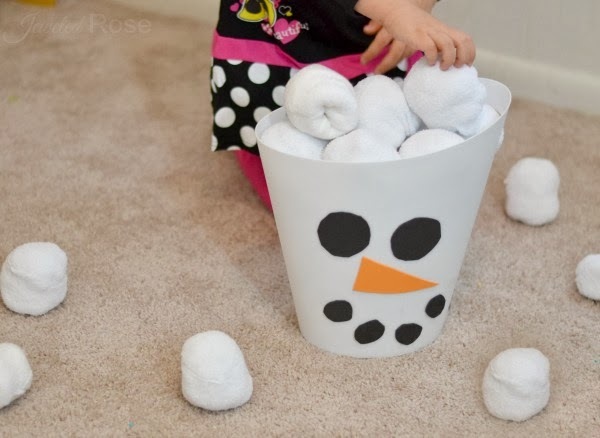 This easy to make game will keep the kids happily playing "in the snow" for hours, and you don't even have to get out of pj's! What kid doesn't love a good snowball fight? 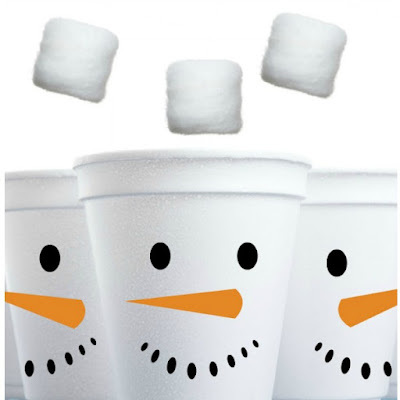 These snow shooters will allow them to have all the fun of the fight without any of the cold!